Archives for March 2017 | SmashToast, Inc. The Internet of Things is set to disrupt the way we live and work, but for now let’s focus on the “live” portion of that statement. Smart homes filled with connected products are loaded with possibilities to make our lives easier, more convenient, and more comfortable. Imagine that you’re driving home on a hot summer day. But rather than turn the air conditioner on when you get home and wait for your house to cool, you simply use your smartphone when you leave your office to tell your smart thermostat to lower the temperature. Or imagine that you’re cooking dinner, and you ask Alexa, the voice assistant on the Amazon Echo, to read you today’s biggest news stories so that you can focus on chopping those vegetables. There is no shortage of possibilities for smart home IoT devices, and home automation seems to be the wave of the future. Below, we’ve compiled a detailed guide on how the IoT and house automation will change our way of life. 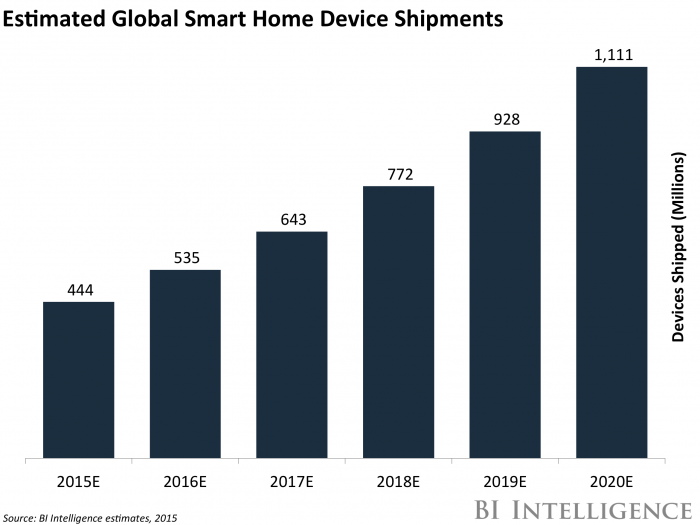 BI Intelligence, Business Insider’s premium research service, expects the number of smart home devices shipped will grow from 83 million in 2015 to 193 million in 2020. This includes all smart appliances (washers, dryers, refrigerators, etc. ), smart home safety and security systems (sensors, monitors, cameras, and alarm systems), and smart home energy equipment, like smart thermostats and smart lighting. But beyond this, smart home IoT devices can help reduce costs and conserve energy. In our example above, you’d have a comfortable and cool apartment when you get home, but you could also leave your air conditioner off when you’re not home, which would lower your electric bill and reduce energy consumption. Smart lights would function in a similar way. And for smart bulbs, there’s the Lifx Color 1000, which can change color as necessary, and the Philips Hue Wireless Dimming Kit for your white-light needs. So who’s putting out these devices? Several companies have emerged at the forefront, such as Amazon, Nest (owned by Google’s parent company, Alphabet), Apple, August, and Philips. And yet, smart homes are just one small part of our daily lives that the Internet of Things will transform in the coming years. Just a while ago, the Internet of Things was only a blossoming idea that many investors did not take notice of and now the industry is expected to be worth trillions by 2020. The modern consumer has become so accustomed to receiving connectivity in most of their communication devices that the progression to other ‘things’ only seemed natural. From the programmable thermostat with Wi-Fi connectivity to tech polo shirts, the IoT is definitely revolutionising the consumer market. All this growth also means lucrative opportunities for investors. When trading with an online broker such as CMC markets, it helps an investor to know the companies to watch out for in the IoT sector. Which IoT technology is worth your money? Smart homes are not the far-fetched concept they were five years ago. The market is presently filled with IoT devices that make it easy to tackle common home chores. Homeowners can now connect every switch in their houses to a single hub, giving greater control. Now you can track your HVAC system from a mobile device with the advent of smart thermostats. Refrigerators have touch screen interfaces where people can top up their groceries. A product like Amazon Echo, with its voice-activated command, has become very popular in homes. Smart bulbs are other products that have made quite an impact in smart buildings. These systems come with a range of colours that suit different settings and dimming capabilities that help with energy efficiency. The need for more intelligent appliances and home systems continues to drive things, particularly in the IoT sector. As consumers come to comprehend the benefits of home automation, demand increases. Couple that with the fact that prices keep going down and you have a thriving industry worth investing in. Since at least the introduction of The Jetson’s television show in 1962, the hope of a fully automated “smart home” has been an alluring and tantalizing idea. Unfortunately, though, few areas in technology have been as disappointing and elusive as smart homes that really make our lives better. There just haven’t been many “killer apps” despite lots of efforts to try to introduce technologies into our homes and the applications that have been introduced have seemed more like novelties than truly valuable innovations. I feel that is about to change, though, so I think it’s interesting to look at the growing potential for several killer apps in the home automation space. By far the most successful smart home device has been the Nest Thermostat. This simple device replaces your home thermostat and functions in two key modes – it learns your habits and sets the heating and cooling accordingly or it allows you to change the temperature from your smart phone or tablet. The Nest Thermostat folks strongly tout their energy savings, but the energy savings aren’t appreciably more than what someone would expect from any programmable thermostat. It is much cooler to show off, though, and as more Nest connected devices come on board, the functionality will increase significantly. There are also competing smart thermostats on the market. Another related device that I’ve followed closely is the Keen Home controllable vents. These smart vents replace the regular vents in your home and take temperature readings in each room. They can then open and close to adjust the temperature differently in each room. Keen Home had a successful Kickstarter crowdfunding campaign and is rolling out new connected solutions. I’ve personally never lived in a house that didn’t have some rooms burning up while other rooms were freezing, so I’m really looking forward to getting one of their sets soon. One device I do have – and can’t stop showing off – is the Ring Doorbell. The Ring Doorbell replaces your regular doorbell with a motion sensing HD camera and voice conferencing system. Any motion triggers the sensor to turn on streaming video from my front door and if someone does ring the doorbell I can answer it from anywhere using my smartphone. All motion detection and ring-triggered videos are stored on the cloud and can be sent or saved as needed. My 6-year-old son recently rang the doorbell just to call me to tell me what was on his mind – which is the only video I know I’ll save so far. If an intruder triggered it or the accompanying add-on cameras, though, I’ll have that video to give to law enforcement. I can even tell the intruder in real time that the police are on the way and he is on video. The Ring Doorbell integrates with other cameras, some security systems, and other home automation systems. Another set of devices I saw at the 2016 Consumer Electronics Show is now more widely available – the BeOn smart light systems. These cool lights look just like regular light bulbs but each bulb contains a battery and smart connection system. The lights can imitate your normal light patterns when you are not at home, turn on all the lights when your doorbell rings or a fire alarm sounds. They can even run the lights for up to 5 hours when the power goes out. The coolest thing to me is their simplicity. They come out of the box ready to be plugged into a regular light socket, require almost no setup, and have a simple user interface through a key fob or smartphone. The other major category of killer apps all focus on home connected solutions that enable easier purchases from home. Amazon introduced their Dash buttons and Walmart/Peapod have followed suit with their Hiku scanner. Both systems allow you to quickly and easily reorder household items while it’s on your mind, but they have completely different approaches. Amazon has 250 individual Dash buttons with a different brand name on them. Push the button and that specific product is ordered though Amazon Prime. Walmart’s Hiku is a scanner that connects to your smartphone and thus has a wider selection without placing 1000 logo buttons around your home. Amazon then will deliver via Amazon Prime and Walmart/Peapod do the same in their relevant delivery territories or make it available for in-store pickup. Whether it’s Samsung’s smart refrigerator that allows you to look inside your fridge to see if you need milk from your smartphone at the grocery store, or roaming kid’s robots that act as security systems, there is no doubt smart home solutions are already hitting the market in big ways. It’s hard to say which ones will prove themselves worthy of finicky consumers, and a solution as smooth as The Jetson’s Rosie the Robot is still not quite here, but the future is certainly looking bright for smart home automation. Let’s just hope the most valuable solutions are just around the corner.